This is the first post in an ongoing collaboration with our friends over at Denton Haunts. They'll be providing us with a monthly history lesson to help us better understand the crazy and colorful past of our awkwardly awesome little town. This month they've provided us with a story about the infamous John B. Denton. 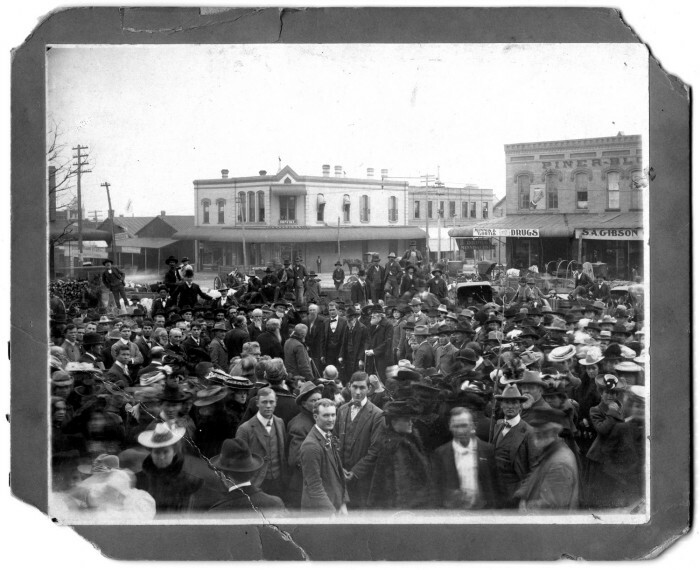 Last weekend was Denton Countys 167th birthday, so it seems a perfect opportunity to recall the life and legend of our namesake, John B. Denton. Even longtime locals may scratch their chin if asked for details about the local hero interred in the grave-site on the Courthouse Square. Luckily for us, Shaun Treat of Denton Haunts is full of local stories and almost-forgotten lore about places and people like this pioneer, himself a fascinating mix of history, mystery, and myth. Few verified accounts of John B. Denton exist, and even those are often highly romanticized. All agree that he was an eloquent speaker and beloved community leader who left an indelible mark on North Texas. Orphaned in Tennessee at eight and a runaway working as deckhand on an Arkansas River flatboat by twelve, Denton would became a circuit-riding Methodist minister who journeyed the untamed wilderness borders of what is now Missouri, Arkansas, and Texas for a decade. This was treacherous travel in unforgiving elements for meager pay, keeping him away from his growing family even as he navigated uncertain weather, savage terrain, and the roving raiders of the Indian Nations with only his Bible, rifle, and wits. By 1830, Denton settled his wife and five children near present-day Clarksville to become a frontier lawyer as the contested territories seethed with tensions that would lead to the Texas Revolution for Independence in 1835. In 1840, Denton lost a bid for Texas Congress but he was made famous in his campaign, beloved by children, respected by elders, and admired by acquaintances. Denton was commissioned as Captain in Col. Tarrant’s Fourth Brigade of the Texas Militia in 1839, tasked with protecting the lives and property of the scattered frontier settlements from the recurring attacks by roving Comanche and other Native American raiders of open-range livestock on moonlit nights. We may today comfortably debate the ethical merits of Westward Expansion and Native American cultural difference, but for Denton’s contemporaries, theirs was a daily struggle for uncertain survival in an often unforgiving frontier. While some tribes and settlers attempted to forge relations for tenuous coexistence from mutual understanding, others would trade brutalities of prejudice; and perhaps thus it has always been. What is certain, however, is that after a murderous raid of a neighbor’s Clarksville homestead in April of 1941, Denton rallied his militia of Rangers. By May, a company of Tarrant’s 4th Brigade militia under Capt. Bourland left Fannin County to recover livestock and exact revenge upon the raiders. Captain Denton, commanding a small detachment of scouts with Henry Stout, located Indian encampments along Keechi Village Creek (near present-day Arlington) and proceeded to raid then burn the first two villages with little resistance. Denton and Stout split into separate units to scout further, stumbling upon a sprawling streamside community now alerted to their presence. Stout cautiously halted his men but the fiery-tempered Denton fearlessly charged ahead into an ambush by rallying braves. In the fire-fight, Captain Denton was killed immediately and Stout was wounded while their unit scrambled to withdraw. Learning that the Keechi villages contained over a thousand braves, now returning from a hunt, Tarrant called the retreat. The fleeing brigade buried Denton’s body under a tree beside the creek as they hastily crossed into what would become Denton County, later so named in 1846 to honor their fallen hero. Yet the story of John B. Denton does not end with the Battle of Village Creek. When a grave was discovered by some boys along Oliver Creek in Denton County in 1856, Denton County rancher John Chisum (who would become a legendary cattleman and one namesake of the famed “Chisholm Trail“) recalled the stories of Denton’s death and burial told to him by his father Clabe, also a member of Denton’s Texas militia company. The cattleman investigated with survivors of the raid, who identified the bones by the blanket they were wrapped in, an old broken arm, and some gold teeth. Chisum took the remains back to his home and buried the box in a corner of his yard to await reclamation. When Chisum sold his property to J.M. Waide years later, he left a written account authenticating the grave with his friend J. W. Gober. By 1900, the Old Settler’s Association of Denton County wanted to bury John B. Denton in the town that proudly bears his name. They placed an advertisement in the paper which John Gober answered, producing the letter written by Chisum authenticating the remains. These remnants of Captain Denton were exhumed once again and buried during a large ceremony on the southeast corner of the Denton County Courthouse lawn on November 21, 1901, then 60 years after Capt. Denton’s death and 44 years after the city of Denton was founded in 1857. There are also ghost stories of Denton’s restless spirit, tales that are best told another time, but the colorful story of Captain Denton nevertheless reminds us that our history can inform intriguing insights into our present and future. Shaun Treat is an assistant professor in Communication Studies at the University of North Texas and founder of the Denton Haunts historical ghost tour. I’ve written about John B. Denton at my Denton Haunts blog, but am forever indebted to the great work of fine folks with the Denton County Historical Commission and local keepers of history like Mike Cochran and Laura Douglas at the Emily Fowler Library for their tireless work in helping preserve Denton’s colorful past.